Enhance your experience of Shanghai regardless of time constrains on a morning or afternoon half-day sightseeing tour. See the best of Shanghai with a knowledgeable guide as you discover historical highlights like The Bund and the Jade Buddha Temple. Learn the complex process of pearl cultivation at the Fresh Water Pearl Gallery; absorb the antique charm of Shanghai Old Street; and delve into the city’s rich historical heritage at Shanghai Museum. Convenient round-trip transportation from your Shanghai hotel is included on this tour. Depart from your Shanghai hotel in a comfortable, air-conditioned vehicle to begin your enriching exploration of the city. Select a morning or afternoon tour to suit your schedule, then see a selection of spectacular sights that vary according to the time of day. If you choose the morning tour, absorb the sacred majesty of the Jade Buddha Temple; see how precious pearls are cultivated in the Fresh Water Pearl Gallery; enrich your knowledge of Shanghai’s history at the Shanghai Museum; and wander amid the verdant beauty of People Square. On the afternoon excursion, see the gorgeous greenery of the Yuyuan Garden; admire the antique charm of Shanghai Old Street; marvel at the symbolic structure, The Bund; and see how silk has been produced for hundreds of years at the well-established Silk Factory. Please see the Itinerary section below for detailed information on each attraction. For any visitor to China, perhaps the most attractive thing about Shanghai is just how fashionable it is. Museums, galleries, restaurants, etc. have emerged in the past few years. The heydays of the 1920s and 30s and the newfound wealth in the city are making Shanghai a place with a fabulous and optimistic style and attitude. Your tour begins with Jade Buddha Temple. It was built during the Guangxu period of the Qing Dynasty (A.D. 1875-1909) with its priceless collection of jade statues from Burma. The construction of the temple is in the magnificent architectural style of the Song Dynasty. 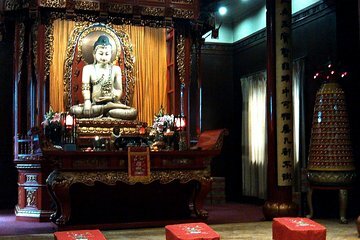 There are monks currently living in the Temple and the Temple houses the Shanghai Buddhist Institute. Next stop is Fresh Water Pearl Gallery. We may see the process of pearl cultivation. One lucky participant will be presented with a single pearl from a mussel. People Square is a spectacular space in the heart of the city. It is a vast green area including plants and trees, and surrounded by great buildings on all sides, where you may feed the lovely doves to pray for the world peace. The visit to Shanghai Museum is a real highlight. The museum design is in keeping with Feng Shui principles. It houses a great permanent collection and hosts various exhibitions with over 120,000 pieces including bronze ware, ceramics, paintings, calligraphy, sculpture, ancient Chinese coins, jade carving, ancient furniture, and western art, which shows you 5000 years history of China. We recommend you to rent an audio phone (USD 5) to make 1.5 Hours' visit more splendid. Then, the tour stops at the Bund on Shanghai's waterfront, a showcase of pre-1949 architecture. The symbol of old and new Shanghai, Bund is Shanghai's most famous landmark. Four kilometers long, the Bund has long been one of the most important areas in Shanghai, and a must to visit to every visitor. In the 1930s, the row of buildings was host to the city's financial and commercial centers and the world's greatest banks and trading empires established a base here. The silk factory in Shanghai is not only an interesting place to see how Chinese silk has been produced since the 14th century, but also a desirable site to purchase in low price. After a drive along the former French Concession District, characterized by beautiful, tree-lined streets and weathered European architecture, you will visit the Finally, you'll be able to stretch your legs in Shanghai's hottest new entertainment district, Xin Tian Di. The brick buildings on these two-square blocks have been preserved and transformed into trendy clubs, restaurants and boutiques. You will have time on your own here, or can go back to your hotel with the group. Since October 2017, Shanghai Museum is closed on every Monday. You will visit M50 Art Zone instead if your tour is on Monday. Great tour guide. He was very helpful and spoke wonderful English! Was the first thing I did when I landed in Shanghai, and was a great way to quickly get acclimated with the city. Would highly recommend to all first time visitors. I enjoyed seeing many of the highlights of Shanghai. I highly recommend this tour to get an overview of this beautiful city. Great day, all went well, We got to see so much in our very short stay in Shanghai. Everyone was very helpful and the tour guide spoke perfect English. It was extremely well organized and everything went like clockwork. Thank you for making our trip so memorable. I only wish we had booked a full day! Our traveling companions were terrific, the guide and driver were excellent. We had some great shopping opportunities. The city is beautiful, and this tour was a great way to be introduced to it. Recommended! That was a good tour with knowledgeable guide. We enjoyed the Shanghai museum very much as well The Jade Buddha Temple. The pearl factory was also interesting. We recommend it! who wants to see modern art in shanghai ???? total waste of time .